And he thought the best way to do that was to tease. Faith! you've teased me till I've put on my cloak inside out." For 'tis all for good luck," says bold Rory O'More. 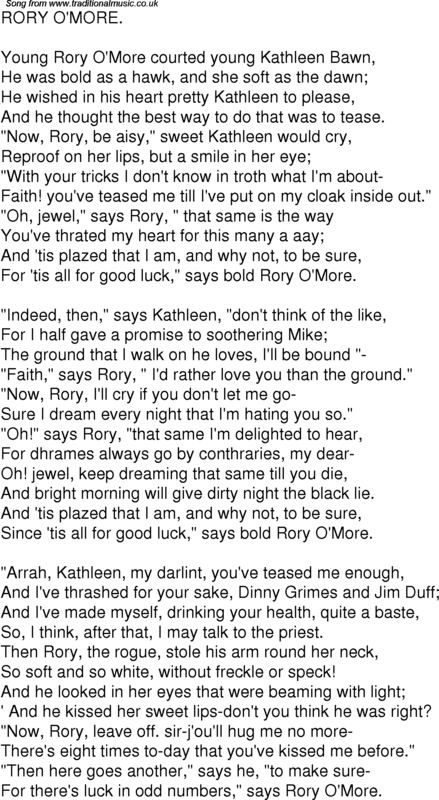 The ground that I walk on he loves, I'll be bound "�"Faith," says Rory, " I'd rather love you than the ground." Sure I dream every night that I'm hating you so." And bright morning will give dirty night the black lie. Since 'tis all for good luck," says bold Rory O'More. So, I think, after that, I may talk to the priest. So soft and so white, without freckle or speck!
' And he kissed her sweet lips-don't you think he was right? "Now, Rory, leave off. sir-j'ou'll hug me no more�There's eight times to-day that you've kissed me before." For there's luck in odd numbers," says Rory O'More.